This comment was posted to reddit on Jan 23, 2015 at 6:34 am and was deleted within 1 hour(s) and 37 minutes. The colors you're seeing are a bit more exaggerated and aren't exactly precise. Exposure, distance and alterations of hue's can give different variations of the same image; basically, the apparent luminosity -- given the frame of reference, is relative to the equipment used and the distance at which the object is observed. 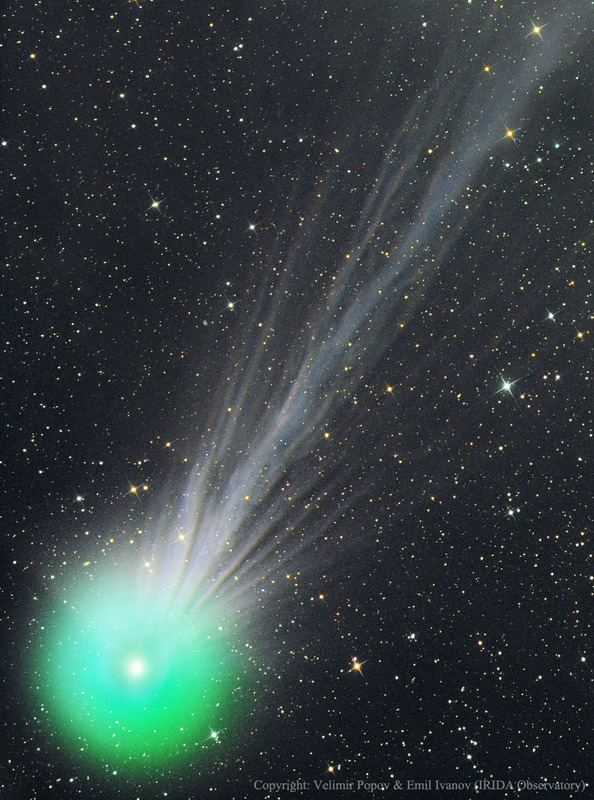 Putting that aside, Comet's are often referred to as "bright," if their magnitude is larger than 12 because at that magnitude, the comet should still be visible through amateur aperture telescopes, without the need of substantial exposure times. I'm not sure how familiar you are with the calculations involved in determining magnitudes of luminosity so i'll try my best to explain it - apparent magnitude is how "bright" something appears to us on Earth based on a scale that was created by Hipparchus, given by the formula: M1-M2 = -2.50log(B2/B1), where M1 and M2 stand for apparent magnitudes of two different "objects," and B2/B1 stands for brightness. Knowing that this is a logarithmic equation, a large range in brightness will result in a smaller range of magnitude, A.K.A larger magnitude = lower brightness. Luminosity can be calculated by knowing the relation between distance, temperature, and distance : B = L/4πd2 , where B is apparent brightness, d is distance, and L is luminosity : through basic algebra you can rewrite the expression to determine the luminosity assuming you know the distance : L = 4π/d2 B. Understanding the relationship will tell you that it's entirely possible for a small and hot star to be more luminous than a larger, cool star. That's why a feint star can appear to be brighter than an obviously more luminous star due to its distance - a good example being between the Sun and Spica. The sun has an apparent magnitude of -23.7~ and Spica has an apparent magnitude of 0.9~, although it might seem as though the sun is significantly more luminous because of its negative magnitude value, Spica is actually 12000~ times more luminous than the sun, but since it's much closer to Earth, it appears brighter. MIT grad Katie Bouman, 29, is the researcher who led the creation of a new algorithm that produced the first-ever image of a black hole How Spacecraft Docking Mechanisms Work - Docking vs. Berthing explained Vice President may tell NASA to accelerate lunar landings: "We're tired of generating PowerPoint journeys that don't go anywhere." Finding the Shape of the Universe Every visual simulation of big bang is misleading, as it shows the "bang" from far away perspective, like viewer is watching it from a distance. The fact is that there was no such perspective available. There was no space outside the bang to stand at and watch the explosion. Scientists may have solved one of the biggest questions in modern physics, with a new paper unifying dark matter and dark energy into a single phenomenon: a fluid which possesses 'negative mass". This astonishing new theory may also prove right a prediction that Einstein made 100 years ago. Europe unveils design of reusable rocket that looks a lot like a Falcon 9 Would it be easier to travel to a habitable planet or terraform an uninhabitable one? By the time Saturn V cleared the launch tower, it had already burned 4% of its fuel We are 'well on our way' to finding alien life, says Nasa boss Saturn rising from behind the Moon 13 more Fast Radio Bursts (FRBs) detected by Canadian CHIME telescope, including the second ever detected repeating FRB. What experiments would you like to see done on the International Space Station? Since objects that orbit us (Earth) such as satellites tend to eventually fall back into our atmosphere and burn up, is the Moon ever in danger of colliding with Earth because of this phenonmenon? Also why do satellites fall back to Earth? Lastly what about the planets and the sun colliding? What happened before the Big Bang?